Let's talk about what is the derivative of an integral. This question is asked by a lot of readers. It seems that we all know there is a relationship between derivative and integral, but we quite can't memorize it. In this page I want to explore this topic and explain everything in detail, so you can leave without any doubt about it. There is a distinction in calculus between indefinite and definite integral. The definition of the indefinite integral of a given function is: a function whose derivative is the given function. We talked about this in detail on the page on indefinite integrals. That is, the derivative of an integral equals the function you are integrating. We need to get our heads around the fact that the equation above is true because of the definition of indefinite integral. We don't need to prove anything. Just by definition. This is why you can always check your answer to an integration problem by taking the derivative of what you got, and show that it equals the function you were integrating. You might want to save the image of the equation above in your permanent hard drive memory: the derivative of an indefinite integral equals the function you are integrating. Now let's talk about the case of definite integrals. When talking about the derivative and a definite integral, we need to talk about the fundamental theorem of calculus. The definition of definite integral is much more intuitive that that of an indefinite integral. The definite integral of a function on a given interval is defined as the area under the graph of the function, inside the given interval. We talked about this in detail on the pages on the definite integral, and the fundamental of calculus. This formula gives an efficient method of calculating definite integrals. On the page on the fundamental theorem of calculus we focused on showing the intuition behind this formula, and proving it. This equation tells us how to take the derivative of a definite integral. Note that this formula works for any a, and any x. This formula has a very interesting intuitive interpretation. 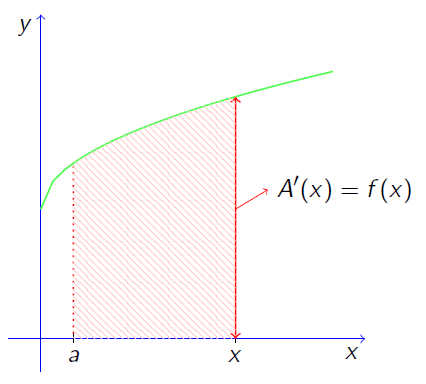 As we said, the function F, given by the integral in the equation, gives the area under the graph, from a to x. The formula is telling us how this area is changing when x changes. The derivative gives us the rate of change of the function, remember? In words, the equation tells that the rate of change of the area under the graph, from a to x, equals the height of the shape at the extreme corresponding to x. On the page on the fundamental theorem of calculus, where I used the letter A to represent F, I used the following picture to explain this concept. Here we are considering the red area above as a function of the point x, on the x axis. As the picture shows, the rate of change of the area, A'(x), equals the height at the point x, which is given by f(x). I think that settles the derivative of an integral issue. If you still have doubts or want to discuss a problem, leave me a comment below. I'll be happy to help you.